There are times when I feel like having macaroni and cheese and don't feel like going through the bother of making a white sauce and melting cheese and adding it to macaroni and baking it. With this recipe there are several huge advantages. You can make only what you want to eat. It is a one pot meal. It only takes 5 minutes longer than cooking the pasta. It is the same every time. The kids will love it. 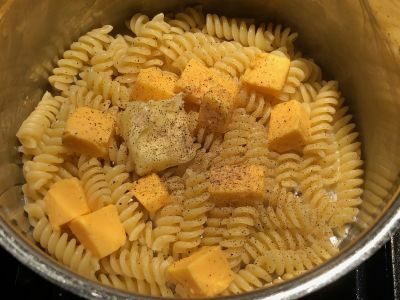 Basically you cook and drain the pasta, add it back to the pot, add some butter and milk and some cut up Velveeta cheese, and mix it all together. That's it, you're done. And you can use any shape pasta you want. So whether you are making it for 1 person or 10 people it is the same process. The recipe below is based on 4 ounces of pasta (1/4 lb). You can multiply this recipe to make whatever amount you want for however many people you want. So if you are serving a crowd and want to make 1 lb of pasta, just multiply everything by 4. 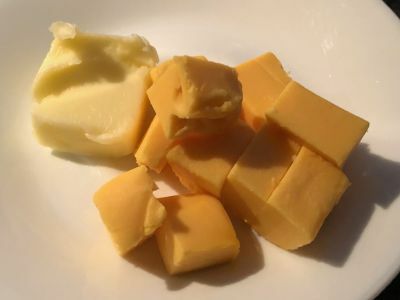 And if you want it creamier, add more butter and/or milk, cheesier add more cheese, etc. It's that simple. Enjoy and let us know what you think and what you add to it to make it even better. 1. Add enough water to a pot to boil the pasta as per the instructions on the box and bring it to a boil over high heat. 2. When the water is boiling, add the pasta and cook according to the directions on the box. 3. When the pasta is cooked, turn off the heat, drain the pasta in a strainer or colander and return the cooked pasta to the cooking pot. 4. Add the butter, milk , Velveeta, celery salt and pepper to the cooked pasta and stir. 5. 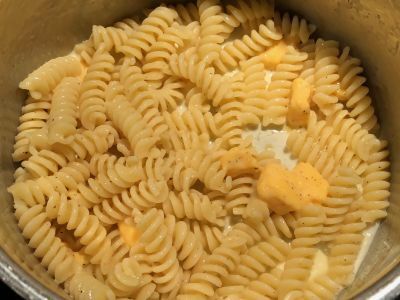 Turn the heat on under the pot to medium low and continue to stir until the cheese is melted and incorporated evenly into the pasta. 6. That's it, it is ready to serve. This makes a great 1 pot dish and you can serve it with anything or eat it on its own as a meal. 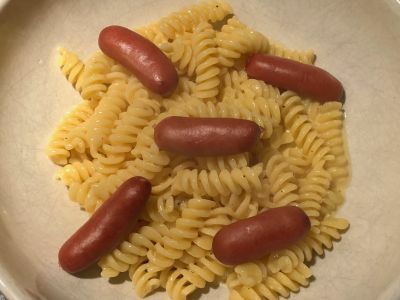 And try boiling up some hot dogs and cut them up and add them to the macaroni and cheese. Your kids will love you forever! Regarding the pasta, you can use any kind you want. Whether it be elbows, rotelle, penne, rigatoni, farfalle, shells, fusilli or whatever you choose, it will be good every time and the kids can have fun choosing what kind of pasta is their favorite.